Just pour and scrape for $0.08 per sq. ft.!! We've taken mastic removal to a higher level! 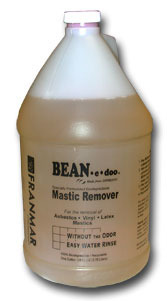 BEAN-e-doo� Mastic Remover makes the removal of asbestos mastic, carpet mastic, and ceramic tile mastic clean and simple. Users of BEAN-e-doo� Mastic Remover are amazed at the NO ODOR and EASY CLEAN-UP properties of this product. Just pop the tile or pull up the carpet. Then pour BEAN-e-doo� Mastic Remover on the surface. In about an hour you will be amazed at how the mastic turns so soft you could scrap it off with your business card! All that is needed for clean up is a water rinse. To ensure a pristine clean-up process try our EMERGE concentrated degreaser. ...*Note: Bean-e-doo Mastic Remover is not recommended for use on wood surfaces.